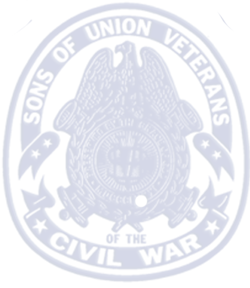 Eligibility in the Sons of Union Veterans of the Civil War is open to male descendants (sons, grandsons, great-grandsons, nephews, grand nephews, great grand nephews, etc.) of Soldiers, Sailors, Marines, or Revenue Cutter Service who were regularly mustered into Federal Service and served honorably in, or were honorably discharged from, or died in the service of the Army or Navy of the United Stated during the War of the Rebellion, 1861-1865. Membership applicants must be at least fourteen (14) years of age and must not have been convicted of any heinous or notorious crime (felony). In addition, the applicant and his ancestor(s), through whom eligibility is claimed, must not have voluntarily borne arms against the Government of the United States. Junior Membership is available for male descendants between the ages of six (6) to fourteen (14), with the same stipulations as stated above. Men who do not have the ancestry to qualify for hereditary membership, but who demonstrate a genuine interest in the War of the Rebellion, and who can subscribe to the purposes and objects of the Sons of Union Veterans of the Civil War may become Associates. An Associate may vote and hold any office except that of Commander-in-Chief. Associates may not exceed one-third of the total membership of the camp at the time of election. 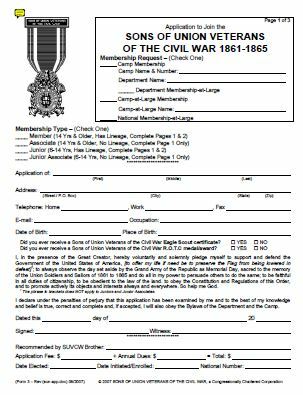 The membership application can be viewed and printed from the National website here: SUVCW Membership Application. Once you have completed and have or need proof of service, send it to our Camp Secretary for further instructions.